Mouthwatering comfort dishes and an exciting game of basketball form the perfect pair as the Philippine National Basketball Team (Gilas Pilipinas) gears up to make history at the most prestigious international basketball competition in Spain slated for August this year. Global Filipino brand Max’s, the official restaurant of Team Gilas Pilipinas serves up exciting promos to bring the Gilas excitement to the hilt. Max's will be giving Filipinos a once-in-a-lifetime opportunity to watch the Philippines' very own Gilas team compete against the best basketball players in the world with its Fly to Spain Promo. Customers may simply enjoy their favourite Max’s dishes at any Max’s Restaurant nationwide. For every PhP 300 food purchase made until July 12 (dine-in, take-out or delivery), customers will be entitled to one raffle coupon and inch closer to watching their favorite Gilas players compete live in Spain. They may also utilize social media by uploading a “puso to the Max” selfie (photo of oneself with right arm across the chest), posting the hashtag PusoToTheMax and sharing these on Twitter and Instagram. One winner will get the amazing privilege to fly to Spain with a companion, get free game passes for two, and be treated to free accommodations and pocket money. As support for Gilas Pilipinas pours in, customers may also experience everything Gilas by just visiting Max’s Restaurant. They may now listen to the favorite music and sample the top 5 dishes of Gilas players while dining at Max’s. On top of the Gilas Team’s list of favorite dishes is Max's world-famous fried chicken, crispy on the outside and delectably tender on the inside. This dish is given an exciting twist and can now be enjoyed “Pinoy-Style” with 3 new dips to make each bite more enjoyable: Max's gravy, chilli sauce and Pinoy sarsa, to create a different kind of thrill for diners. 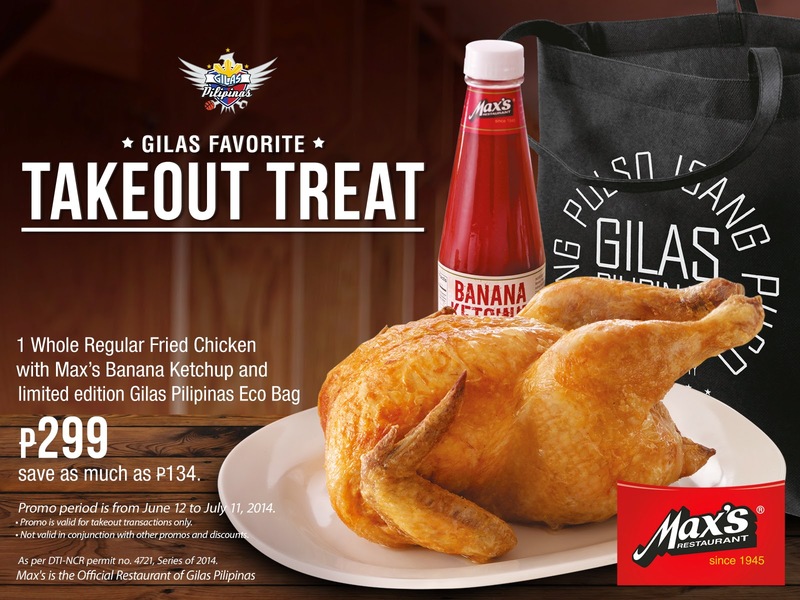 After a satisfying meal at Max’s, customers may avail of Max’s Gilas Take-out Treat and bring home their favourite Max's sarap to the bones fried chicken, paired with Max's classic banana ketchup and a limited edition Gilas eco bag. This promo is valid for take-out transactions worth PhP299 until July 11. 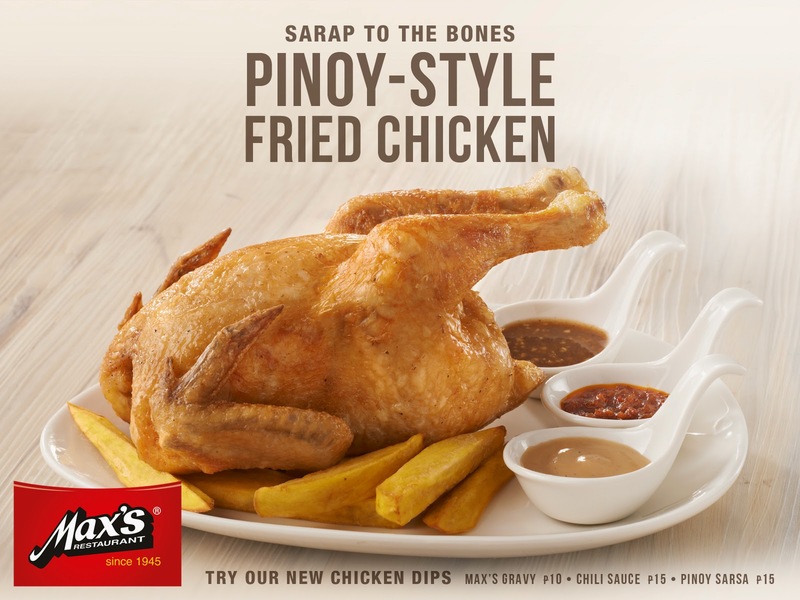 “With these new offerings, Max’s endeavors to create more exciting opportunities to celebrate two things that Filipinos love – basketball and Max’s sarap to the bones fried chicken. Whether they are in the Philippines or in any other country around the world, they can all take pride in being a Filipino and share in the Puso to The Max experience,” shared Mark Gamboa, Marketing Director for Max's Group of Companies. To learn more about Max's Gilas promos, visit Max's website www.maxschicken.com and Max's official Facebook fan page.